I can blog about it eh? That means it must be related to graving. This should be easy. The present was a very small square and very thin. I quickly took the gift and hid it next to the bed, that way I could look at it every night. After countless nights of poking and prodding at it, I finally had my guess, it was related to graving, and certainly unusual, “It’s a headstone ice scraper!” I exclaimed. Not wanting to let me down on my ridiculous guess, Anita simply said “you’ll see.” Spoiler alert: It wasn’t a headstone ice scraper. So what was this super unusual thing that she had never seen before that I could also blog about? It was a baseball card. A baseball card for a cemetery. I had never seen anything like this before, and it was definitely the most unique graving related item I had ever seen. 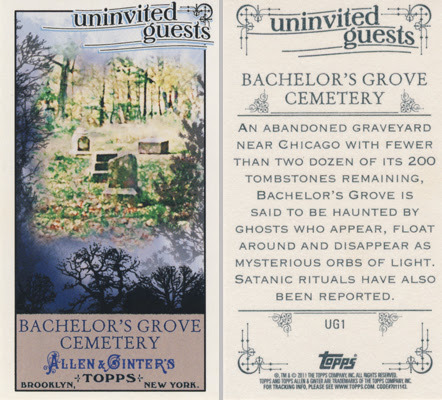 The card is titled “Uninvited Guests”, and has a picture of an overgrown cemetery surrounded by eerie trees. Of course my interest in this cemetery was immediately piqued, and I set out to find out about this cemetery as it must have an interesting history if it was put on a baseball card. Bachelor’s grove cemetery was established in the 1840’s and at one point had as many as 200 headstones, a stark contrast to the less than 20 that now remain. Over the years the cemetery has fallen into disrepair since a major road was re-routed away from the cemetery and the area evolved into a party spot for local teenagers or a place for dark rituals. Local lore even states that the murky pond next to the cemetery was used by the mob as a place to get rid of dead bodies, as it was much easier to just chuck a body in the pond rather than try to bury a body without being discovered. Authorities in the area tried various half-hearted ways of trying to stop the destruction of the cemetery, like blocking off the entrance with trees and other debris, but it wasn’t until the hobbyists came around that the cemetery started to get some care and protection. Lured by the stories of ghost sightings and strange happenings, people interested in hobbies ranging from ghost hunting to graving made pilgrimages to bachelor’s grove and began to document and care for the cemetery. Recently, there have even been efforts to recover headstones that were thrown into the pond. Bachelor’s Grove isn’t nearly as well kept up as it could be by any means, but there is now a move in the right direction. You never know what you’ll see at the end of the overgrown (and ever so slightly creepy) road that leads to the cemetery itself, but these days you’re probably more likely to meet friendly types like ghost hunters or gravers taking photos than people performing dark rituals. I wish there were more items like this card for graving enthusiasts, as quite honestly I am pretty attached to this one and would love to start a collection. That said, I am going to Chicago in August and thanks to this unusual card I now plan to visit Bachelor’s Grove. I am not sure about going alone though…who wants to come with me?